WebView allows an application to load pages either by URL or an HTML string, and navigate within the session history. By default, links to different pages are loaded within the same WebView, but applications can choose to delegate those links to other functions. The following example loads a web page, responds to session history context, and intercepts requests for external links. 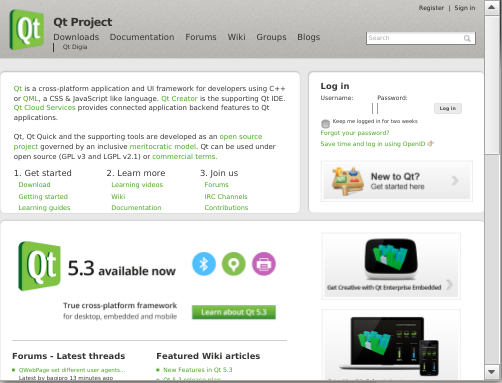 It also makes use of ScrollView from Qt Quick Controls to add scroll bars for the content area. Details various high-level error types. InternalErrorDomain Content fails to be interpreted by Qt WebKit. NetworkErrorDomain Error results from faulty network connection. HttpErrorDomain Error is produced by server. DownloadErrorDomain Error in saving file. Specifies a policy when navigating a link to an external page. AcceptRequest Allow navigation to external pages within the web view. IgnoreRequest Suppress navigation to new pages within the web view. Distinguishes context for various navigation actions. FormSubmittedNavigation Form data is posted. BackForwardNavigation Navigation back and forth within session history. ReloadNavigation The current page is reloaded. FormResubmittedNavigation Form data is re-posted. OtherNavigation Unspecified fallback method of navigation. The location of the currently displaying Web site icon, also known as favicon or shortcut icon. This read-only URL corresponds to the image used within a mobile browser application to represent a bookmarked page on the device's home screen. The amount of the page that has been loaded, expressed as an integer percentage in the range from 0 to 100. The title of the currently displaying HTML page, a read-only value that reflects the contents of the <title> tag. Within a mouse-driven interface, this signal is emitted when a mouse pointer passes over a link, corresponding to the mouseover DOM event. (May also occur in touch interfaces for mouseover events that are not cancelled with preventDefault().) The hoveredUrl provides the link's location, and the hoveredTitle is any avalable link text. url: the location of the resource that is loading. status: Reflects one of three load states: LoadStartedStatus, LoadSucceededStatus, or LoadFailedStatus. See WebView::LoadStatus. errorString: description of load error. errorDomain: high-level error types, one of NetworkErrorDomain, HttpErrorDomain, InternalErrorDomain, DownloadErrorDomain, or NoErrorDomain. See WebView::ErrorDomain. AcceptRequest: Allow navigation to external pages within the web view. This represents the default behavior when no listener is active. url: The location of the requested page. navigationType: contextual information, one of LinkClickedNavigation, BackForwardNavigation, ReloadNavigation, FormSubmittedNavigation, FormResubmittedNavigation, or OtherNavigation enum values. See WebView::NavigationType. keyboardModifiers: potential states for Qt::KeyboardModifier. mouseButton: potential states for Qt::MouseButton. External objects such as stylesheets or images referenced in the HTML document are located relative to baseUrl. For example if provided html was originally retrieved from http://www.example.com/documents/overview.html and that was the base url, then an image referenced with the relative url diagram.png would be looked for at http://www.example.com/documents/diagram.png. It is important to keep in mind that the html string will be converted to UTF-16 internally. Textual resources, such as scripts or style sheets, will be treated as UTF-16 as well, unless they have an explicit charset property in their referencing tag. If an unreachableUrl is passed it is used as the url for the loaded content. This is typically used to display error pages for a failed load. Stop loading the current page.